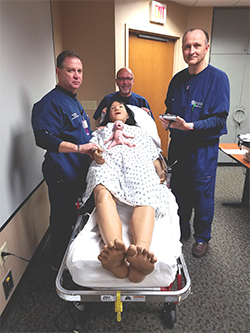 WISER was please to host a demo of @LaerdalMedical Nursing Anne Simulator prototype and the Premature Anne SimPad compatible simulator. A special thank you to Mellissa Steckel-Wanker, Regional Sales Manager with Laerdal for allowing the opportunity to learn more about this unique new technology. Pictured are Jon Mazur, Marty Mayer and Kevin Miracle from WISER interacting with the simulators.